The Swedish-engineered, low-profile baitcaster that combines high-end performance with everyday reliability to give you a solid, easy-fishing reel to match with your favorite rod. Seven ball bearings plus a corrosion-resistant Instant Anti-Reverse bearing; aluminum frame and spool; Duragear hard brass gears including oversized main gear; Pitch Centrifugal Brake; Power Disk drag system. "this is a very good reel i've had it for about a month now and so far its gave no problems. it is very smooth it is as good as the the victory reel made by wright and mcgill." 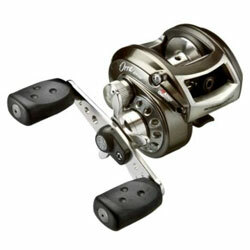 "This reel is excellent for this price point! The centrifugal brakes really do their job and the reel casts smooth as silk. The retrieve is also very smooth. I will definitely be picking up a couple more of these!" "I loved the orra. I have several other more expensive Abu reels but I liked this one just as much. It seemed to cast light weight lures farther than my others... It worked great than the reverse bearing went out. To tell you how much I liked it I bought a second one.."